About 70 homes were evacuated and authorities briefly closed a highway early Wednesday after a wildfire spreading through a swamp moved toward communities south of Waycross. A 35-mile stretch of U.S. 1 was initially closed to traffic, though portions of the highway were later reopened, said Tracy Smith, a spokeswoman for the Georgia Emergency Management Agency. The fire crossed state Route 177 and was threatening the small communities of Astoria and Braganza about three miles south of Waycross, Smith said. Waycross, a city of 15,300, was not in immediate danger, she said, though heavy smoke covered the city. Wildfires have burned 53,000 acres, or about 67 square miles, of forest parched by drought in southeast Georgia in the past nine days. CBS affiliate WETV in Jacksonville, Fla. reports that 400 firefighters from more than 80 fire departments across Georgia and Alabama have responded to the fire. 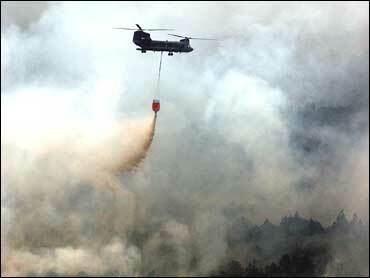 The cost of fighting the fire so far has risen to $1.6 million. The fire has destroyed 18 homes. So far three firefighters have been injured, as was a child last week who wandered into a smoldering area near the fire, and was being treated for major burns. The fire started April 16 when a downed power line ignited tinder-dry trees in Ware County. Officials said Tuesday the blaze was 50 percent contained by fire breaks plowed along its perimeter. But winds have kept shifting direction over the past week, threatening to cause pockets of smoldering embers to flare back to life. More than 1,000 Ware County residents have been forced to evacuate since the fire began, and 5,000 others have been urged to leave voluntarily because of health risks associated with heavy smoke. Darryl Cribbs and his family left their home in Braganza after sheriff's deputies came to their door around 1 a.m. Wednesday. They piled spare clothes, a few valuables and their six dogs into three cars as the fire burned less than a mile from their house. "It looked like it was snowing with all the ash falling. You could feel the heat," said Cribbs, 44, who took his family to stay with his parents. "They said as soon as we left they were going to bring in tanker trucks and try to save the house." The wildfire spread rapidly Tuesday night and early Wednesday near the private, nonprofit Okefenokee Swamp Park, fueled by dense and dry trees and brush. Firefighters tried to protect nearby homes after their occupants fled. As of Tuesday afternoon, firefighters said the fire was 50 percent contained, which is up from the 35 percent containment Monday. At a Red Cross shelter in Waycross, Curtis Cowart said his family had been warned twice last week that they might have to evacuate. They had already unpacked valuables they planned to take with them by the time they were told to flee Wednesday. "I wasn't going to leave, but I looked and saw the flames and the smoke and it looked like it was getting closer" said Cowart, 61, whose property near Astoria backs onto the swamp. "If it comes through those woods, I don't know if they can stop it." The fire, less than 10 miles southeast of Waycross, sent up a towering cloud of smoke near the entrance to the park. Firefighters tried to slow the blaze by igniting underbrush ahead of it, hoping the fires would merge and burn each other out competing for fuel. They also hoped U.S. 1, the four-lane highway at the park entrance, would keep fire from spreading to nearby homes. About a dozen residents who live within a mile of the park gathered Tuesday across the highway and nervously watched the orange glow from the fire behind the trees. "I wasn't scared last week, but this is scary," said Kelli Lee, 33, who said she has kept valuables packed for the past week in case she has to evacuate. "I know I won't sleep tonight, that's for sure."